DALLAS (AP) — Patti Fitch never thought to record videos of her mother. The Dallas Morning News reports of course, she knew the stories, about her mother’s Polish heritage or job at AT&T. But she never captured them on camera — to preserve her voice, mannerisms and tales for future generations. Today, Patti’s mother, Irene Skurla, lives at The Village at Mapleshade, an assisted living center in Plano. She’s 85 years old with short white hair and purple glasses. Her days are a routine of meals, activities and TV on a couch. But thanks to an app created in Dallas, on some afternoons, Irene will tell a story. The app is called OneDay. It’s a prompted question-and-answer app — with topics such as childhood, wartime and romantic experiences — that records a video, which is then shared with family members via text or email. 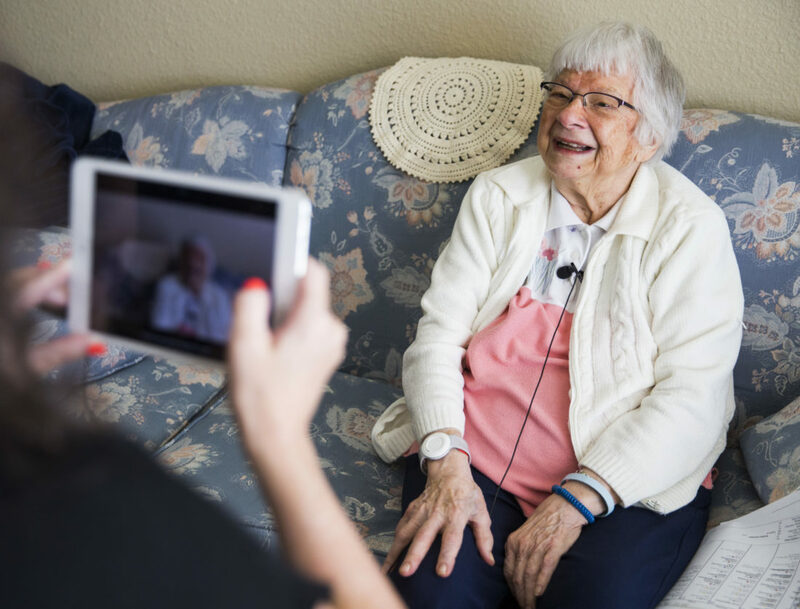 “Let’s talk about your ancestors today,” said Lynn Brink, the Vibrant Life Director at Mapleshade, who sat across from Irene on a recent Tuesday afternoon with the app open on her iPad. She asked the first question that popped up on the screen, and pressed record. Irene smiled and began, talking about a mother from Poland and a father from New York City, in a way only Irene could tell it, a five-minute story that would be captured and emailed to Patti and other loved ones. It’s exactly what the creator of OneDay intended. As a teenager, Clint Lee spent after-school days and holidays helping seniors. His parents owned assisted living homes in McKinney. He’d dress up like the Easter Bunny, buy groceries or mow the front lawn. But many days, he’d just sit and listen, to stories about war, life back in the day or the ones that got away. He realized then that these uncaptured stories were important. But it didn’t hit him personally until he was 23. That’s when his grandfather died, and he and his father, John Boaz, realized they had little video or audio to remember him by. So the University of North Texas graduate set out to find a solution for other families. Six years ago, he created and co-founded a technology company with his father called OneDay with a goal to preserve stories. Since then, there have been multiple incarnations of the company, but last January, OneDay rebranded to focus solely on older generations. The app is exclusively licensed to senior living communities. Today, OneDay is in 1,000 locations across the U.S., Canada and the United Kingdom. For now, individuals can’t buy the app. The app, which is compatible with iOS platforms and will soon be on Android, is easy to use. Senior living facility members simply need to select a topic, ask the questions that pop up on screen and press record. When finished, an automated video is created, with high quality audio and music. The video is sent via a private link by text or email to relatives and loved ones. Family members can also view the resident’s videos on their personal OneDay life story page, and even submit questions or topics of their own. The app costs $150 to $250 per month depending on the size of the senior living community. Lee said there are plans for expansion to different markets, as well as possible consumer use in the near future. “The meaning behind OneDay is we tell your story, one day at a time, for your kids to one day have,” Lee said. “I feel like if I knew my grandpa and great-grandpa’s story, and the ins and outs of them as men and what made them great husbands and what their struggles were, I would have a better connection to them. Overall, I’d be a better man. A better husband. A better father. Irene sat on the couch across from Brink with a microphone hooked to the lapel of her shirt. She stared at the iPad as it recorded a story about her heritage. Her story started with her mother, who arrived at Ellis Island in the lower deck of a ship from Poland. Mapleshade has been using the app for seven months now. Every week, Brink tries to find a different resident to record. She finds it improves the relationships she has with the seniors, as she’s able to get to know them on a more personal level. Some videos have already proved priceless. In June, a resident died, and the family featured a OneDay video on the online obituary. Irene, who’s been at Mapleshade almost a year, continued on. She talked about her father working in real estate and his time during the Great Depression. After a handful of questions, Brink pressed create video. The video was emailed to Patti. The following day, she clicked the link as she sat in her office. There was her mother, miles away at Mapleshade, talking about her ancestry. She looked happy. She was laughing. She was relaxed. Patti couldn’t help but smile along. Of course, she’d heard the story about her grandmother many, many times, from Poland to Ellis Island to Ziegfeld Follies. But now, it was preserved forever.